(Phys.org)—A team of researchers in Portugal has found what they believe to be a teratoma in the pelvis of a woman who died approximately 500 years ago. 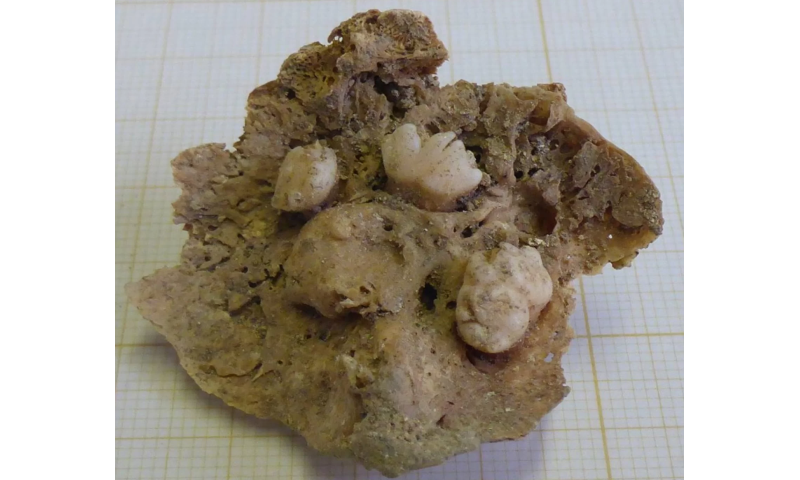 In their paper published in the International Journal of Paleopathology, the group describes the calcified mass with teeth that was first discovered during excavation work sometime between 2010 and 2011. A teratoma is a tumor or cyst that develops on a woman's ovary when cells multiply abnormally and often result in teeth, hair or bones. In this case, the teratoma was small, approximately 4.3 centimeters long, and had five partially developed teeth—four molars and one canine. Such cysts are far more common than was once thought, accounting for approximately 20 percent of all ovarian tumors. Though they quite often go unnoticed, when they are discovered, they are typically removed because they can sometimes grow large enough to rupture, and some have been known to become cancerous. The teratoma was discovered in the pelvis of a female skeleton (who was believed to have been 45 years old at the time of her death, which was likely caused by disease, as she was covered in lime) buried in the Church and Convent of Carmo, a cemetery in Lisbon that was used from the early part of the 15th century until 1775, when an earthquake destroyed the church and many other surrounding buildings. The researchers have not dated the remains of the skeleton, but assume it is from the period during which the cemetery was in use. They note that it took some study of the mass to determine what it was—some suggested it might have been a fetus that had died along with its mother, while others suggested it could have been the result of an ectopic pregnancy. After cleaning and close examination, the team concluded that it was, indeed, a teratoma, and that it had both inner and outer irregular surface masses. The researchers report that there is no indication that the woman was aware of the teratoma—her bones were still normally arranged, indicating it had not caused problems. The teratoma joins a list of just three other known instances of such cysts being found in ancient skeletal remains.